(from Venues Today, October 28, 2013) Colorado experienced devastating floods in September resulting in nine fatalities and an estimated more than $2 billion in property damages. AEG Live Rocky Mountains’ offices dealt with this destruction first hand when one employee lost his entire house and another employee’s apartment was completely flooded. From the minute the floods started, Chuck Morris, President and CEO of AEG Live Rocky Mountains, began discussing with John Hickenlooper, the governor of Colorado, the idea of putting on a benefit. AEG Live Rocky Mountains and Live Nation proudly put on their sold out Colorado Rising benefit concert this past Sunday, October 27th. The concert took place at the 6,500 capacity 1st Bank Center in Broomfield, CO. AEG Live Rocky Mountains operates the facility in partnership with Kroenke Sports & Entertainment, but AEG Live Rocky Mountains did not charge for the use of the facility. They also donated food and beverage profits from the concert as well as ticket sales, parking and merchandise profits to The United Ways of Colorado Flood Recovery Fund. Donating all the proceeds meant the company made no money from the benefit concert. 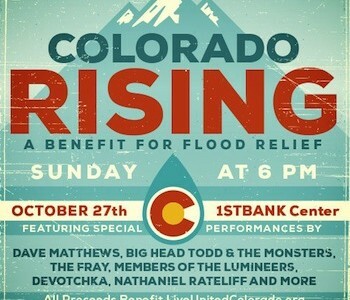 The lineup of Colorado musicians including members of Lumineers, The Fray, Big Head Todd and the Monsters, and an appearance by Dave Matthews set this benefit apart; tickets ranged from $65 to $125 and sold out in just a minute and a half after going on sale October 18th. In the 43 years Morris has worked in the industry, he stated he had never seen a concert sell out that quickly. The quick sellout demonstrates the power of music. Don Strasburg, VP and Sr. Talent Buyer at AEG Rocky Mountains, said, “It’s the job of the entertainment community not only to give people an outlet from the daily tolls of life but also to set up and contribute to crisis.” AEG Live Rocky Mountains hopes those who operate facilities and put on entertainment take charge and lead when their communities are affected.